Alright, so I've done very little in terms of fan art for Knight Rider, but each thing I've done has been something I've put my entire being into to make it the best I possibly can. For your viewing pleasure I give you a movie poster I created not long ago. I won't go through all of the details on how I made it unless you just want me to, in which case I'll gladly tell you about it. sweet poster! I love it! I can't see tyhe poster too!!! Please post the link of it? THANX!!! The poster is embedded into the post. Quoting the post will allow those of us who can’t see the embedded image (myself included) to copy the link, and view it in another tab/window. Given the work that iKITT has put into it, it’s well worth the effort. Looks really cool. Very different than I expected. Thanks for the positive words guys, I really appreciate it! 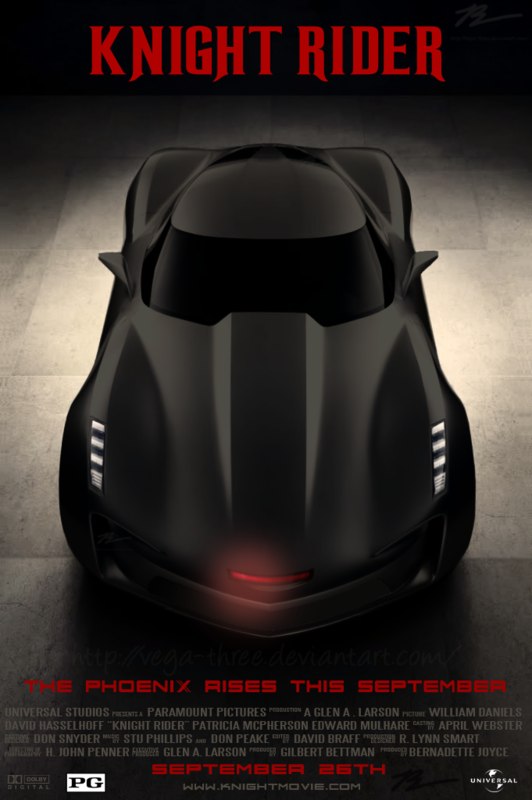 The car is indeed the Stingray and was lightly modified, but not too terribly much. Mostly, the things that made it look so different is the scanner and covering the grille that made it so distinctly Chevy. I also lengthened the nose a smidge and made the body a bit thinner, all in moderation of course. Here's the original picture. Not the exact one I used but it'll give you an idea. Anyone notice the references in the poster to the series? Some are more obvious than others. I love hiding nods to things like this. and a link to it in case you cannot see it. Those streets have more potholes than Devon has neckties. For this poster I was looking for a very large image to work with, with a high quality. No jpegs or jpg files. I searched for a bit with a general query of "sports cars" I think, never found anything eye-catching and then searched this up for the heck of it and as fate would have it, this car fit the bill in many respects. The image has a dramatic angle, and it was high res so I could edit it without it looking obviously Photoshopped/chopped together. That, and no other car stuck out to me. I looked at many American cars, such as the Cadillac Cien and a few others but...ehhhh... They weren't practical. I didn't know the Cadillac Cien, it's beautiful! But, just like you, I can't imagine it being KITT. Also, Stingray's hood is a bit reminiscent to the Trans Am "turbo bulge"
roDa wrote: I didn't know the Cadillac Cien, it's beautiful! But, just like you, I can't imagine it being KITT. Also, Stingray's hood is a bit reminiscent to the Trans Am "turbo bulge"
The car wasn't made for the mass market, rather it was a concept to celebrate Cadillac's 100 year history. However, it was in a 2005 film called The Island. So it wouldn't be anywhere near practical.